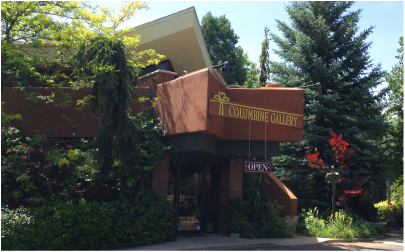 Columbine Gallery provides a tranquil atmosphere for art appreciators wishing to reduce the external details of the world and indulge in the true essence of art ~ a world of visual play and internal moods. Perched above a pond with a view of the Rockies, the National Sculptors’ Guild Sculpture Garden is an acre filled with unusual botanical specimens and over 100 sculpture that rotate out frequently. The garden is divided into a number of outdoor ‘rooms’ to exhibit how the sculptures function in outdoor settings. All of the artwork in the garden is for sale and as a result, the look of the garden is constantly changing. The attached Sculpture Garden has become a destination for avid art collectors, tourists, city officials and organizations from around the world.